The Catri 24 has a large aft cockpit providing seating for 4-5. The cockpit provides considerable shelter from spray, which is minimised, in any case, by wave-piercing bows on the floats. Down below there are two comfortable cabins, including a large aft cabin with double berth, forecabin with double berth, as well as a saloon with chart table, settee, small galley and generous storage room. 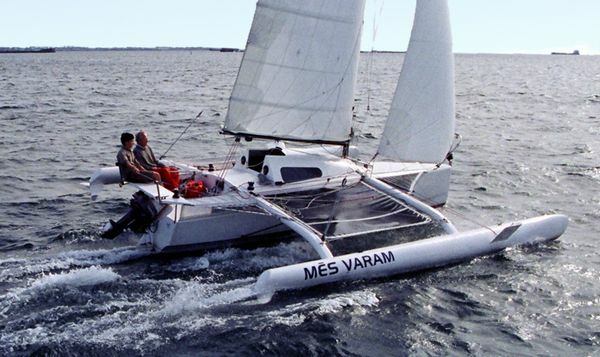 In rough seas the hydrofoil system minimises pitching, adding considerably to comfort and safety while sailing. Only considerably larger boats can generally provide this level of accommodation and comfort: the hydrofoil system maximises interior room, (neither mast nor centreboard encroach upon interior space) and ensures comfortable motion in a seaway. Almost everybody who sets foot in TARDIS exclaims that it is much bigger inside than they imagined, even if they have seen the pictures above. This is why she is called TARDIS, like Dr Who's time machine that is much bigger on the inside than it is on the outside. To give you a better idea, here are some more photos of the interior. The hull of CATRI 24 has increased capacity compared to prototype Catri 23 and is much roomier than the competition. The cockpit has been lifted higher over the waterline and occupies the full width of the hull, while the side seats are placed outside the cockpit. An additional seat is placed at the back of the cockpit. The size of the hull and the planning of internal space are better adapted to the comfort requirements of standing, sitting and lying of crew members. As a result the comfort level of the Catri24 is unexpectedly high for a boat of such a small size. Central cabin full standing height 1.8m. Central cabin table for 5 persons. Bunks for family 4 - 5 with kids. All lines in the cockpit, easy for single handling. Privacy inside the separated toilet.